The Savannah Cat is still a young breed that has been created by crosses with the serval. After in the eighties of the past century already a successful breeding between a	Serval and a Siamese Cat has taken place, from 1994 on it became possible to achieve the breed of Savannah Cats regularly. The name of the Savannah Cat refers to the habitat of the Serval - the savannah in Africa. This breed is still rare and has been created by crosses of domestic shorthair and spotted cats of different breeds with the Serval. 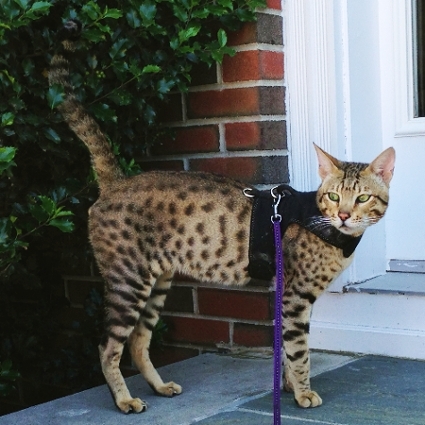 Savannah Cats have been accepted by TICA as a breed and can be registered in the breed section Savannah (SV). The Standard was developed, and since 2012 SBT Savannahs are eligible to enter TICA cat shows in Championship class. The Savannah is a tall lean cat with long legs and a long neck. The head is smaller in proportion to the body and longer than wide with large ears. Similar to the Serval the coat shows a spotted pattern with some bars on a golden, tawny or grey ground color with a light colored underside. Savannah Cats almost appear like smaller replicas of a Serval. This exotic impression is accentuated by light ocelli markings on the back of the ears as well as prominent tear duct lines in the face. F1 and F2 Savannahs can weigh more than 10 kg and stand up to 45 cm at the shoulder. Later generations are showing also a considerable size, although they do not become as tall as the F1. Usually Savannah males are growing much larger than their female litter mates. Due to the graceful and long-legged appearance combined with the movement of a big cat this striking cat is not comparable to any other breed. Savannahs are active, friendly and sociable cats getting along very well with other household pets and due to their playful temperament quickly become friends with children. They show their affection by eager welcoming and giving head butts. Most Savannah Cats are very outgoing and like to be petted. Due to the long legs the Savannah is an elegant jumper and like the serval often performs high leaps straight in the air. Most Savannahs love water and enjoy a bath if given the choice by placing a tub filled with water. 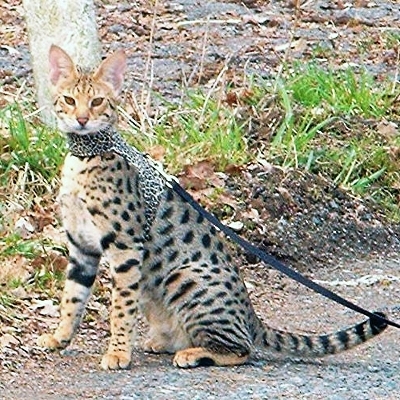 Despite of the exotic appearance Savannah Cats do not differ much from other shorthair cats regarding care and behaviour. Generally Savannahs can be kept like any other cat, although they would enjoy getting a little fresh air from a safe balcony or enclosure. Many Savannahs also like to play fetch or walk on a leash if they are used to it. Savannah Cats can be fed a high quality commercial cat food. Nevertheless a more natural balanced raw diet (BARF) of ground meal, chunks of meat with and without bones and whole prey is beneficial in our opinion. However, this is our personal view regarding keeping, feeding and health care as natural as possible for every cat. You will find more detailed information about the character and size depending on generation as well as housing, feeding, showing and breeding on our Savannah FAQ page. 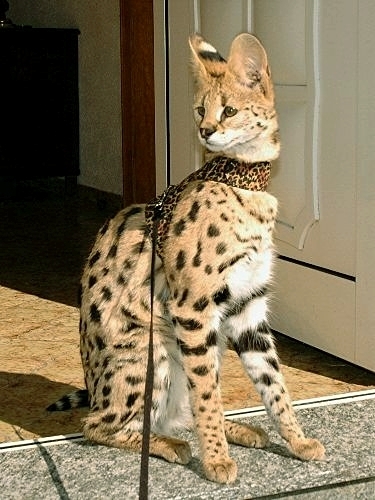 Because of the unique personality, size and exceptional look of the Savannah Cat, imitating the appearance of a wild cat like no other breed, the Savannah maintains a continuously growing popularity. This beautiful, still rare breed certainly will continue finding a lot of attention and increasing interest worldwide. Learn more about the Savannah Cat and our Kiwanga cattery! Since the breed is still quite rare we have put the Savannah FAQ (Frequently Asked Questions) together. Please take the time to read our information and suggestions carefully.